One thing I dislike about Sierra Leoneans is their propensity for quickly forgetting the goodness and exemplary performance of their own kith and kin. We always thrive on negativity, bad mouthing praiseworthy people and creating the wrong impressions about them, especially when we dislike them . One person who is a victim of this retrogressive attitude and is not receiving fair treatment from the opposition Sierra Leone People’s Party (SLPP ), in general , especially its Chairman, John Oponjo Benjamin, is President Ernest Bai Koroma. 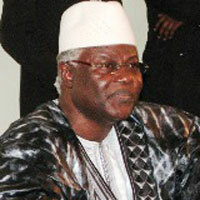 In the face of all the overwhelming odds facing him as President of a nation emerging from war and one where old corruption mafias set up before he came to power are very formidable and still flourishing despite the President’s best efforts to crush them , and people do not really want to concentrate on working very hard to help rebuild the country, Dr. Ernest Bai Koroma is doing a fantastic job. You have to be inside to know that governance is not an easy task in countries like Sierra Leone, which has been battered by war, bad governments, chronic corruption, lethargy, laziness, unpatriotism and also encumbered by wrong perceptions of politics , government, acountability and transparency . Governing a country like Sierra Leone is more difficult than governing more advanced democracies like Britain or the U.S. where people are more educated about and fullly au fait with their responsibilities as citizens and patriots and where the generality of citizens are making great efforts to understand the problems in the light of the global economic slump, obey the law and the conventions and mores that hold together the society. John Benjamin has been there before and should know that governance in a country like Sierra Leone is not a piece of cake. I therefore find some of John Benjamin’s statements against President Koroma baffling , irresponsible, reckless, unstatesman-like, divisive and unappreciative of the good things being done by the President to reconstruct Sierra Leone and launch her on the paths of progress and the improvement of the welfare of the people. Also Benjamin’s statements are designed to bring chaos to the country . I know that we live in a democracy and the opposition has the right to take the government to task over its policies and performance. However, criticism of the government should be based on the fact . If John Benjamin’s desire is to see Sierra Leone move forward, and not to sow chaos and confuse the minds of the people, his criticisms of President Koroma should be tempered by truth and acknowledgement of the marvellous performance of the President in other areas of governance. He should know that, given our parlous economic circumstances, the minds of our people are open to any influence, even divisive and knave ones. When John Benjamin talks of impeaching President Koroma, does he really mean what he is saying ? Does President Koroma, with his magnificent performance in power which has won him accolades from the United Nations Secretary General, Ban Ki Moon, diplomats of the UN, African Union, Commonwealth, stakeholders and donor agencies and from citizens, look like a President that deserves being impeached ? You can hate your enemy all you want, but efforts should not be made to be banal , unrealistic and untruthful in discussing his perceived weaknesses. At times, we can generate sympathy for our enemies by the untruthful and unrealistic things we say about them. If you impeach a good President like Ernest Koroma, what do you do with the bad boys of Sierra Leone politics like John Benjamin himself , who have left a shameful trail of misgovernance , corruption , deceit, violence and pain in the lives of the Sierra Leonean people ? Benjamin should stop abusing the luck he is enjoying not being under investigation or behind bars presently for all the havoc he has wreaked on this country. He was part of a military junta that committed gruesome atrocities , including the unnecessary bludgeoning with bayonets and decapitation of 29 Sierra Leoneans falsely accused of planning a coup .The victims were never tried and if John Benjamin does not know that what he and his cohorts committed was murder , it is time people started telling him that . Secondly, John Benjamin was the Finance Minister in a government that a transitional committee audit found to have embezzled millions of dollars of donor funds . Many people listening to Benjamin plotting to overthrow President Koroma are wont to say that the President gave him the impetus because if Dr. Koroma had put the likes of Benjamin on trial and made them account for the millions of dollars they stole while in power, he would not have had the temerity to be making such outrageous claims designed to sow confusion and chaos in the minds of our vulnerable people. However, President Koroma is a true democrat and nation-builder who decided to concentrate on uniting the country and moving it forward socio-economically and politically than putting former SLPP operatives on trial for corruption, abuse of office and squandering of donor funds. A President who in only three years of governance has been able to do the things that the SLPP failed to accomplish in 11 years –like bringing electricity and water supply back; reconstructing infrastructure and building new, modern highways ; providing free medical insurance for lactating mothers, pregnant women and children; improving Sierra Leone’s standing with international donor agencies and stakeholders and paving the way for assistance to the country ; opening up the country to investment, trade and tourism; etc.etc. –certainly deserves respect and national and international acclaim and acceptance, and not impeachment. Let us face the truth . Even President Tejan Kabbah, for all the mistakes of his government, did not deserve impeachment. If this is so, how much more a progressive and productive President like Dr.Koroma who in fact deserves a second term ? Let us be realistic with our national problems. President Koroma has done nothing to deserve impeachment. If John Benjamin is so greedy for power, let him wait for the 2012 elections and test his popularity with the people . He is not qualified to contest as the SLPP Presidential candidate but he can manipulate the SLPP constitution if he wants or if his party allows him and test his mettle against President Koroma in 2012. That will be better than vainly trying to overthrow a government that is presently doing its best to improve the lives of the people.